Since the new year, I’ve been tracking my sleep habits using a nifty app Lark, which I purchased last year after viewing their unforgettable (and dramatic) demo at Techcrunch Disrupt New York. 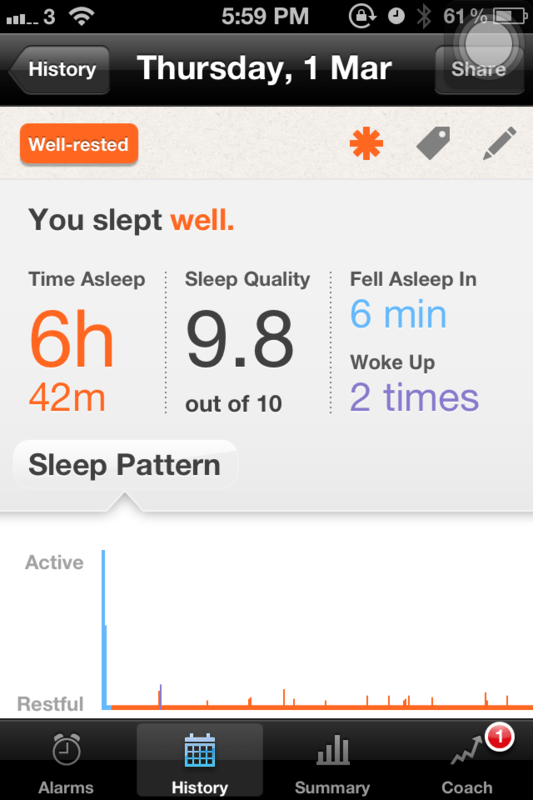 Connecting a small wristband, the app tracks sleep data including exact time you’re asleep, times you wake up, the amount of time it took for you to fall asleep. 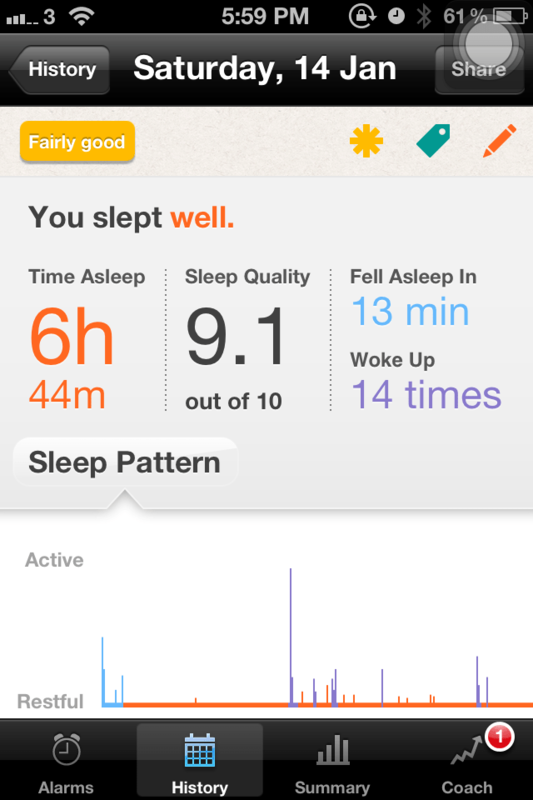 I never felt like I had a sleep problem, but being a data junkie, I quickly became addicted to tracking sleep patterns. It soon dawned on me that I tend to wake up a lot during the night, as much as 14 times. Over the course of four weeks, I implemented small habits and have seen incredible improvement to my sleep (waking up 2 times only!). 2) Limit caffeine intake. As much as I’d love to become a tea drinker, I am still holding onto the smell of great coffee in the mornings. Aside from switching to peppermint tea as much as I can, the most effective way to better sleep is to avoid caffeine after a certain hour of the day. While everyone has a different sensitivity to caffeine, I find it helpful to cut out caffeine after 4PM. 3) Make your bedroom a sanctuary for rest. In the age of mobile internet, the temptation and ability of receiving the latest information is ever so increasing. A few useful tips to set the stage include, place the phone beyond arms reach from the bed, switch to silent mode (or even without vibrate for light sleepers), make the bed a laptop-/phone-free zone. 4) Exercise at the right time. When we have excessive energy, our body tends not to rest properly. With a regular exercise regime of 3-4 times a day, I consciously incorporated more variety into the regime, with cardio, weights, yoga and TRX spread throughout the week. For those who are getting into the habit of exercising, I suggest finding a gym/running buddy or a group, which makes the routine a lot more fun and accountable (you never want to cancel on your friend!). Aside from that, I added a short yoga sequence before bed time; dandasana (perfect seated pose), pashimottanasana (seated forward bend), marichi’s pose (seated spinal twists). Both forward bends and twists are sedative; with a straight back, seated forward bend helps release the back tension and stretch the hamstrings, and twists massage the digestive organs. 5) Be patient. It takes at least 21 days to create a new habit. Improving sleep is no exception. Instead of agonizing about a potential insomnia, remind yourself that a relaxed mind is the foremost important to better sleep. How well do you sleep? What other tricks do you use to sleep better? Photo Credit: Seated forward bend, yogajournal. Seated spinal twist, acefitness. This entry was posted in Cities, Thrive and tagged michelle, thrive. Michelle (Hong Kong) is an entrepreneur in Hong Kong. She studied in Chicago, worked in NYC and Beijing and celebrates a former life as an excel monkey at a bank. A lover of new experiences, she is enchanted by good food, an encounter of a new neighborhood and an inspiring book. When she is not at her computer, she can be found teaching or practising Vinyasa yoga. Drop her a note to say hi! Interesting. I read about polyphasic sleep and some people did experiment with it (http://www.dustincurtis.com/sleep.html) as a sort of mind hack. Would you be up for trying this out? Soooo smart. I’ve been using the Sleep Cycle app to do a similar experiment; I’m a terrible sleeper when I’m stressed (which is often), but haven’t done much with it other than acknowledge the data as being accurate. I’ll have to try your tips out, particularly #3 – no more using the laptop in bed! Hahaha.